When I started this series on Walking in the Spirit I referenced Colossians 1:27 so I want to close with it as well. While it may not seem apparent at first, understanding this passage, Christ in us as the hope of glory, is the doorway into communion with Him. To understand that we need to understand communion the way it is presented by the scriptures. When we hear the word ‘communion,’ what ideas and images does the word evoke? Do we think of the ritual we tend to go through on a monthly basis in evangelical churches? Do we consider the role of rituals and symbols in our faith? They are all meant to point us to something, or more specifically, in the case of communion, to someone. The ritual is meant to remind us of Jesus sacrifice and to lead us into a deeper experience of Him as we reflect on His sacrifice and the reason for it. Something very real and meaningful should take place when we partake of the elements. Think about what Paul meant when he wrote the following? What is the ‘communion of the Holy Spirit?’ The word is Greek is koinonia and in addition to many other places the word is found in the following scriptures. Given the significance of koinonia /communion for our lives as believers I am including a long section from a Greek dictionary. We are primarily indebted to Paul for providing more information about the nature of koinōnia in the Early Church, especially in his presenting of koinōnia as a relationship between believers and God. Paul regarded the entire Christian call to be a summons to “fellowship” with Jesus Christ. “Sharing” most notably takes place at the Table of the Lord. For Paul, then, eating and drinking are more than mere symbols, though symbols are involved; eating and drinking at the Lord’s table denote an inner “participation” with Christ. It is the ultimate expression of unity – the common bond – between Christ and His body the Church (1 Corinthians 10:16f.). Furthermore, it is the ultimate expression of unity among the people themselves (Paul’s concern in his first letter to Corinth; cf. Philippians 3:10; Philemon 6). Such unity is experienced through the Spirit (cf. 2 Corinthians 13:14; Philippians 2:1). Even Barnabas’ offering of the “right hand of fellowship” (koinōnia, Galatians 2:9) signaled their common bond of faith (see also Hauck, “koinōnos,” Kittel, 3:805ff., who investigates how Paul’s sun , “with,” compounds contribute to the concept of koinōnia). Four instances of koinōnia occur in the First Epistle of John (cf. the use of the verb in 2 John 11). Each of these is central to the letter (cf. 1:3, John stated his purpose in writing: “that ye also may have fellowship [koinōnia] with us”). John regarded koinōnia as an impossible relationship apart from its being experienced both vertically with God and horizontally with humanity. If one has koinōnia with God the Father and His Son Jesus Christ (1:3), then one will have koinōnia with other believers who have this same relationship to God (1:6,7). If fellowship does not exist between believers, then any claim to have fellowship with God is invalid. The converse, though not stated, would also be true: True human koinōnia is impossible apart from koinōnia with God. Given that communion also includes participation and fellowship what does communion mean in our lives? It is meant to be an ongoing encounter with Jesus through the Holy Spirit that overflows into our other relationships. How do we experience the communion of the Holy Spirit in practice? He reveals to us the one living in us. Jesus is manifest to us through the ongoing ministry of the Holy Spirit. Jesus says we can ‘know’ the reality of Him living in us and us living in Him! When revealed in our lives the fruit of the Spirit listed in Galatians 5:22-23, love, joy, peace, patience/longsuffering, kindness, goodness, gentleness and self-control is a manifestation of His presence in our spirit. This is ‘Christ in us the hope of glory.’ His glory is His nature or character. When we learn to develop intimate communion with Him more of His character is evident in our lives, He is formed and revealed in our mind, will and emotions. Our thinking aligns with His word, our feeling aligns with His heart and our choices reflect His desires. This all flows from fellowship with Him, sitting and letting Him touch our hearts through His word and presence. The only way to experience the fruit of His presence is to spend time pursuing His heart. This requires aligning our lives with His. Can any of us fully align our lives with His and continually deeply experience Him? I don’t know, but as we enter a new year is it not worth trying? There is a phrase that some of you may be familiar with – Constant Conscious Communion. This is the thing Brother Lawrence and others wrote of, living in and out of Him. It doesn’t come out of removing ourselves from the world; it comes out of learning to lean into His heart each day and seeking to be sensitive to His presence throughout the day. If we embrace His purpose we will be conformed to His image. So may we embrace this journey and learn afresh what it means to sit at His feet as Mary did. While conscience may seem to be the most obvious of the three aspects of our spirit, it can at the same time appear to be the least ‘spiritual’ while also being the aspect we experience the most. Of the other two, spiritual intuition seems to be the aspect we need to understand the most and communion the aspect we desire. So, I will continue this trifecta looking at intuition then closing it off dealing with communion. First, insight and intuition are processes that at times are confused. I won’t do a complete teaching on the two; the general distinction is that intuition is the initiator of a process and insight the completion. Intuition is an often undefined sense of something that we need to learn to pay attention to whereas insight is the ‘aha’ or realization that comes when we see the fruit of following our intuition. We use language like a ‘gut feeling’ to refer to intuition, which is appropriate since scripture locates the experience of our spirit in our belly. The literal Hebrew in Proverbs 20:27 is ‘innermost parts of the belly’ rather than heart and the Greek in the John 7:38 is literally ‘belly’ or ‘innermost being’ rather than heart as can be seen in the versions below. While there are many New Testament passages that illustrate the use of intuition the main foundation for understanding it is in 1 Corinthians 2. In the two occurrences in verse 11 and the one in verse 12 the word know/knows is the same Greek word each time, and while it carries the meaning of knowing or understanding something it also carries the meaning of being aware of something. This is how we need to apply it. Through the Holy Spirit we can become aware of things within our own spirit and as we train ourselves to pay attention to His speaking within we learn to recognize His voice in our spirit. Later on in 1 Corinthians 12 Paul enumerates spiritual gifts. One of which is the ‘word of knowledge.’ In application I have found in my own experience that the word of knowledge functions through awareness in my spirit. I have a sense of something about someone either when praying for them or when looking around at a group of people while seeking to pay attention to my spirit. I take this intuitive sense (the initiation of the process) and share it with the person I am praying for or with a group of people. When they respond and affirm what is happening two things happen. One is the insight, the completion of the process is achieved, and two, faith is increased because they know I had no way of naturally knowing what I just shared. Please note, this learning to pay attention to Him works at work or in the community as well as in church settings. I have had people weep because I spoke something to them that I had no natural way of knowing, it came from the Holy Spirit. I once shared something from the Holy Spirit and the individual suddenly doubled over like they had been punched in the stomach due to the impact in their spirit. I have had people shared detailed things about my life that they could not naturally know. These examples illustrate the fruit of learning to listen to the Holy Spirit speaking in our spirits. Let me further illustrate with some examples of where we see this in the life of Paul and Jesus. Please note, these examples are illustrative not exhaustive. You will find many more if you search the New Testament. I want to further develop how the different aspects of our spirits grow, starting with our conscience. I believe we generally view conscience as a psychological component of our being yet it is rooted in our spirit and is our internal arbiter of right and wrong. Let’s look at what the New Testament teaches us about how our conscience functions. First, our conscience is our source of conviction as the following scriptures show. Note that the Romans 2:15 reference refers to both believers and unbelievers. In fact the context is showing how all people have the law of God written in their hearts, a spiritual reality. Paul’s point below is that all of us have our conscience built in. So back to the idea that our conscience can grow and develop; this helps us understand what Paul taught about weaker consciences and leads to the need to differentiate between fellow believers with a weak conscience and legalists who generally seek to control others liberty. Romans 14 is about is about how our conscience functions. The focus in chapter 14 is on those with a weak conscience, implicit is the idea that our conscience can be in different stages at different times. After laying out the issue in chapter 14 Paul provides a conclusion in chapter 15. His point is that we need to be sensitive to the state of the conscience of other believers. With more revelation from, and understanding of scripture, what we experience in our conscience will mature. That is, our minds are renewed by embracing the truth of scripture (Rom. 12:1-2). For example, a regular part of my prayer life is to discern between conviction, the Holy Spirit speaking through my conscience, and condemnation, psychological feelings of guilt that leave me no way out. A truth to apply in this area is in Romans 8. Condemnation is different than guilt, when we have done something wrong if we are walking with Him the Holy Spirit will convict us of sin, however His purpose is to bring us to the place of repentance so that we can have restored fellowship and freedom. The fruit of repentance is intimacy with Jesus. With condemnation we feel bad but don’t see a way out. I referenced earlier the importance of distinguishing between a ‘weaker’ fellow believer and a legalist. Someone weak in their faith may not feel free to do things a mature believer can do, Paul’s used the example from his day of meat sacrificed to idols. As they mature things like this should cease to be an issue for believers. A current example in our day is the use of alcohol among Christians. While it is not something I promote, nor think it particularly good for anyone, it is also not something I oppose because the scriptures do not oppose it. At the wedding in Cana Jesus turned water into wine, His first miracle (Jn. 2:1-11). Likely not what we would have planned if we wanted to reveal the Messiah! Yet, as an aside, everything Christianity is about all culminates in a great wedding feast! There was a prophetic message in Jesus first miracle. The however here is that while scripture allows the use of alcohol it forbids drunkenness, as a quick search or Proverbs would reveal. In this scenario we may choose not to use alcohol around a weak believer so that they are not offended, or we may simply choose to never partake, as I think over time the harms seem to greatly outweigh the benefits. We circumscribe our liberty for their good. If we are unable or unwilling to do that then we need to spiritually mature. What is the difference between a legalist and a weak believer? In the scenario above a weak believer would be open to teaching and over time would be able to embrace the truth of scripture. A legalist would refuse to consider other points of view and condemn those who do not accept their position. An example for me today is those who deny the current validity of spiritual gifts. Despite the fact that millions of their fellow believers around the world operate in them, some very prominent evangelicals deny the reality of spiritual gifts for today. While they may be free in other areas, in this area they are not. They are not listening to the Holy Spirit speaking via their conscience if they are not allowing their position to be informed by the truth of scripture. In truth they hold to a scripturally and experientially untenable position. In this case it would be wrong to circumscribe our liberty and cease to function in ways the scripture clearly instruct us to function. So, back to our conscience growing – Paul laid out how it can be hardened. When we reject light and truth it is as if a veil is placed over our spirits. We become less sensitive to the truth of scripture. This is why Hebrews warns of the danger of drifting from the faith and tells us to daily exhort and encourage one another. Again Paul lays this out well in the passage below. What Paul is teaching in 2 Corinthians 4 is that to be sensitive to the Holy Spirit we need to reject darkness. This includes what we read, watch and discuss. Nothing is without effect and we deceive ourselves if we think we can imbibe darkness and walk in the light. We need to pursue the truth of scripture to have our conscience develop sensitivity to His presence. Let me give John the last word on this matter. Picking up on how spiritual growth is analogous to natural growth, how do our physical bodies grow? Is food and water sufficient? How many of us have heard of feral children, or more commonly, the problems children have if they do not form a proper attachment bond with their mother? Clearly more than just food and water are required. Yahweh designed us so that there are other aspects required for proper growth, things like love, affection, and physical and emotional interaction. We are complex beings designed by a loving God to need both Him and one another to fulfill our calling and purpose. A simple example of this complexity is the impact of gratitude at meal time. I read some research recently that our bodies better digest our food if we pause and are grateful or thankful prior to eating it. Another example of how Yahweh designed us to function in harmony with His design and purpose. There are practical physical and spiritual reasons for saying grace before meals. He has built better health into taking time to focus on Him before we eat. The catch is that the physical effects require actually slowing down and being intentional, not muttering a hurried prayer so we can eat. So back to growth – if we need to grow spiritually we need food, fellowship and time. The aspects of our spirit – conscience, communion, and intuition all need to develop if we are to grow spiritually. This can happen in a haphazard way or a very focused and intentional way. If we want to be intentional we need to know what to feed our spirits and how. We need to know how to have ongoing communion with Jesus and we need to know how our conscience develops. In regard to spiritual food Paul, Peter and the writer of Hebrews gave us some instruction on the place of scripture. We grow spiritually by intentionally ingesting His word and reflecting on it to learn how to apply it to our day to day circumstances. The scriptures inform conscience and intuition as our spirit becomes stronger. For communion, we need to learn to sit with and experience Jesus or meditate and interact with Him through His word, there are no substitutes. In the spirit we can finely hone our conscience via the word and communion with Him. It is important to know that while conscience, communion and intuition may be different aspects of our spirits they are intertwined. 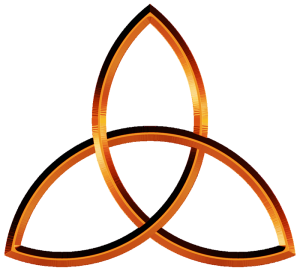 The symbol below, the triquetra, has had many uses and applications down through the centuries. One is that it has long been used to reflect the Trinity and is in fact the symbol on every New King James bible for precisely that reason. You can see in the symbol below that while each of the three parts can be distinctly seen the parts are also intertwined and cannot be separated. It you remove one part you lose the symbol. We can use this symbol to reflect our triune composition as spirit, soul and body, as reflecting the three parts of our soul – mind, will, and emotions, or as reflecting the three aspects of our spirits – conscience, communion, and intuition. We can’t develop one in isolation from the others and we need all three to be whole. Paul went on to say that the whole focus of his life was to present everyone perfect/mature in Christ (Col. 1:28-29). The idea being that Christ in us needs to mature in our spirits. While this may sound strange, think about natural birth. A child is born very dependent and over time grows. During this growth process the parents provide external controls while the child is developing internal control as they mature. This is the process of normal growth. However not all growth follows this process. If all goes well age and maturity are parallel processes. The same should happen spiritually, we should mature as we spiritually age, however we are called to discipleship, which carries the concept of discipline with it, both self discipline and discipline from the Lord. (see Heb. 12:5-7, Prov. 3:11-12, Gal. 5:23). To capture the idea of spiritual growth look at the verses below. The first reference above is to John the Baptist, the second to Jesus. If they both needed to become strong in spirit then we are joining good company in acknowledging our need. This is why Paul wrote what he did in Galatians, which appears to be the first teaching letter he ever wrote. The Greek word translated as formed and the meaning from the Greek are below. μορφόω morphoō verb, Take on form, be formed, shape, fashion. The only New Testament occurrence is at Galatians 4:19. Here Paul used the analogy of a woman’s travailing birth pangs to describe his intense desire and prayer that the nature and character of Christ “be formed” in the lives of the Galatian believers. In order that the morphē (3307), or essential nature of the Christ-life, may come into being in them, Christ must not only be in each of them, but must also grow or “be formed” in them. This process of maturity into Christlikeness is not a mere outward conformity to Christ but a progressive inward transformation of one’s character. Christian growth through the Spirit’s work is a major theme in Paul’s writings. Complete Biblical Library Greek-English Dictionary, – Lambda-Omicron.